Sports Direct founder Mike Ashley. Pic: PA.
Sports Direct chief Mike Ashley has hit out to MPs and unions for using the sportswear retailer as "a political football". The Newcastle United owner hit out as his board insisted they had no knowledge of an undercover recording device which a group of MPs said they found during an unannounced visit to the firm's headquarters. Members of the Commons Business, Energy and Industrial Strategy Committee said they discovered the miniature camera during what was supposed to be a private discussion at the end of their tour of the warehouse at Shirebrook in Derbyshire on Monday. However in a statement, the firm's board questioned the "veracity" of the device found by the MPs and insisted that it had not authorised its use. Founder and chief executive Mr Ashley hit out at the committee - which has been highly critical of the company's employment practices - accusing them of treating his workforce as a "political football". 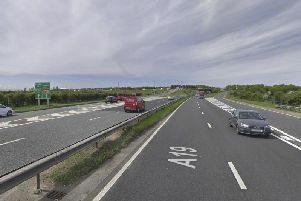 In its statement, the board said: "The board is disappointed that reporting of a possible recording device (the veracity of which has yet to be determined) has overshadowed the truly important issues that this visit should have focused on - the true working conditions and worker satisfaction at Shirebrook. "The board would like to make it clear that it did not authorise or have any knowledge of the possible recording device." Mr Ashley added: "I stand firmly behind the people of Sports Direct, who through no fault of their own have been made a political football by MPs and unions." The latest row between the company and the MPs came after they took up Mr Ashley's offer - made during his appearance before the committee last June - to turn up without warning at the warehouse so they could see the conditions for themselves. At the end of the visit - after the MPs asked for a room where they could hold a short private discussion among themselves - one member noticed that a woman who brought in plate of sandwiches for them had left a camera and recording device on the floor. Committee chairman Iain Wright said the planting of the device was "absolutely disgraceful", adding that they had been seeking to work with Mr Ashley in a "constructive manner". "I don't think he wants to work with us at all any more," he said. However, in its statement, the board said it was "disappointed" the MPs had chosen to visit on a day they knew Mr Ashley would not be on site and complained at the way the row over the device had overshadowed what had been a "positive" visit. "The board understands that the MPs met many members of staff who expressed their positive views of Sports Direct as evidenced by Redcar MP Anna Turley's comment: 'We had a positive tour around, we got to speak to a lot of the workforce and we got to see a lot of people who were very positive about the brand'," it said. "The board understands that, at an impromptu open session arranged for the workforce to share their views with the MPs in the afternoon, many workers expressed their dissatisfaction with how the company was portrayed by the committee and the media."